The beginning of spring brings not only warmer weather and longer days to Bremen – it also brings the Osterweise: The most famous fair in northern Germany. Every year, one week before Good Friday, Bremen’s biggest spring festival begins: the Osterwiese. There’s tons of attractions and plenty of delicious things to eat, providing the whole family with a guaranteed good time. The numerous rides, booths, and stands ensure there is something for everyone to enjoy themselves. It’s over 50,000 square metres of pure fun! Over a million visitors enjoy this event year after year. Around 200 carneys ensure that an amazing time is had by all. Every year new attractions, as well as old favourites, come to the fairground, providing variety and amusement for old and young. 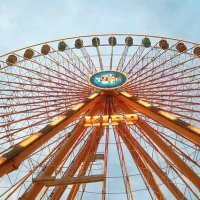 Whether your thing is riding the giant Ferris wheel, visiting the haunted house, or the trying out the Breakdancer ride, everyone will enjoy themselves at the Osterwieser. The Osterwiese offers an amazing day out for the entire family. Take the day and explore the rides, raffle booths, and games of chance and skill. And if you get lucky, perhaps you’ll even see the Easter bunny hop by. After all that fun, you’ll surely be hankering for a special treat. Perhaps a refreshing beverage, or some yummy, sticky candyfloss, or are you in the mood for a hearty bratwurst? There’s plenty of delicious goodies for you to choose from. In addition to the attractions of the fairground, there are special events and surprises. Not to be missed is, of course, the fireworks display. It banishes the last remains of winter and rings in the spring. And there’s also the Easter bunny, who takes up residence at the fairground. Plenty of other special events help round out a delightful 16 days.